I recently picked up this beauty from essence as it was unlike anything else in my collection. 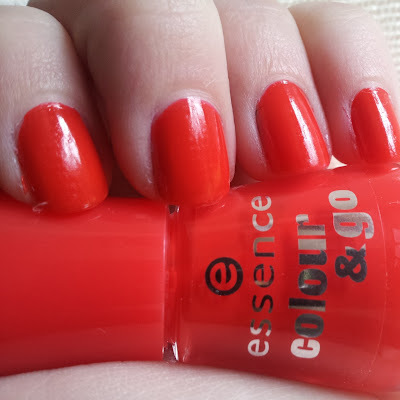 This shade is a gorgeous orange-red. In the above photo I am wearing ONE coat with no top coat. Pretty great, right? That's a perfect shade of red for summer :) love it! When I picked this one up I wasn't sure if I would like it very much but when I put it on the first time I fell in love. It is a gorgeous, bright, summer red. I also love that it is quite orange toned so in different light it can look more red and in others more orange. Another shade that looks great on you.